One of the most widely sought after Mardi Gras throws is the famed Zulu Coconut. Given out annually on their Mardi Gras parade, the hand-decorated Zulu coconut, created by members of Zulu Social Aid and Pleasure Club, has become a staple to New Orleanians and visitors alike. First appearing in 1909 as the Zulus, the group first had its origins in a club comprised of a group of Black men called “The Tramps.” Social groups such as the Tramps worked as communal bonds and financial insurance for members of the Black community. In 1915, Zulu paraded with their first floats, a spring wagon decorated with palmetto leaves and moss, carrying men dressed in grass skirts and black face paint. Instead of the traditional "throws" of glass beads, they handed out coconuts purchased from local markets. In 1916, in the notarial office of Gabriel Fernandez, the Zulu Social Aid and Pleasure Club incorporated. In the early years of Zulu, the king would arrive by barge on the New Basin Canal, where he disembarked to throngs of people and lead the parade through of back streets of the Lower Garden District, Back o Town, and Treme neighborhoods. The reign of Louis Armstrong as king in 1949 gave the club international notoriety and fame, and was the first time a celebrity monarch represented a New Orleans Carnival club. In 1969, the city of New Orleans invited Zulu to join the official route and celebration on St. Charles Avenue and Canal Street preceding Rex, where they are a center attraction Mardi Gras morning. But Zulu breaks the standard Uptown route to still pass down Basin Street and Orleans Ave through the historically Black Treme neighborhood. During the 1970s and 1980s membership expanded and helped grow the size of the parade and number of floats. Throughout the years, Zulu Social Aid and Pleasure Club has become a stable to New Orleans communities, providing Christmas baskets to needy families, contributing scholarship funds, and adopting schools. And of course, every year providing coconuts to visitors and New Orleanians of each generation. Today, Zulu Social Aid and Pleasure Club's headquarters is located at 732 North Broad Street. 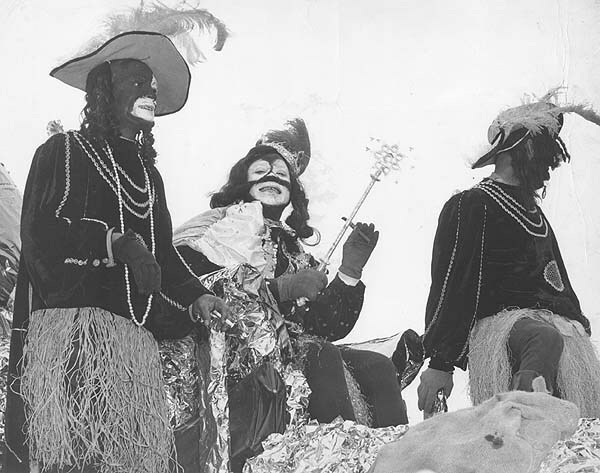 Louis Armstrong reigning as King Zulu, 1949. ~ Source: Image courtesy of the New Orleans Public Library, Louisiana Division/City Archives. ~ Creator: Charles P. Bennett, Photographer. ~ Date: March 1, 1949. 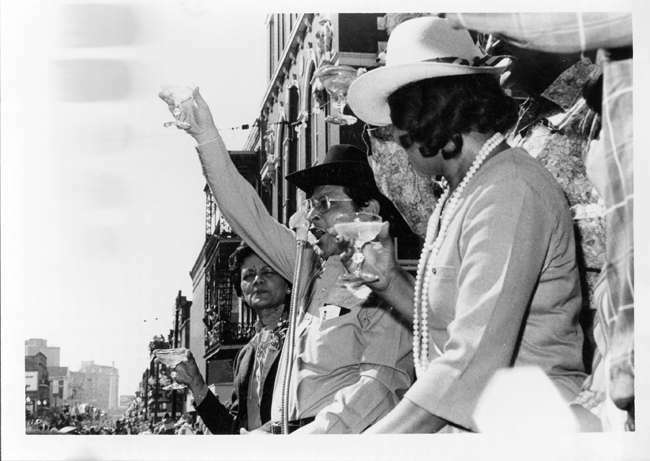 "Mayor and Mrs. Morial toast King and Queen Zulu in front of Gallier Hall, Mardi Gras Day" ~ Source: Image courtesy of the New Orleans Public Library, Louisiana Division/City Archives. ~ Creator: Porter's Photo News ~ Date: Undated. 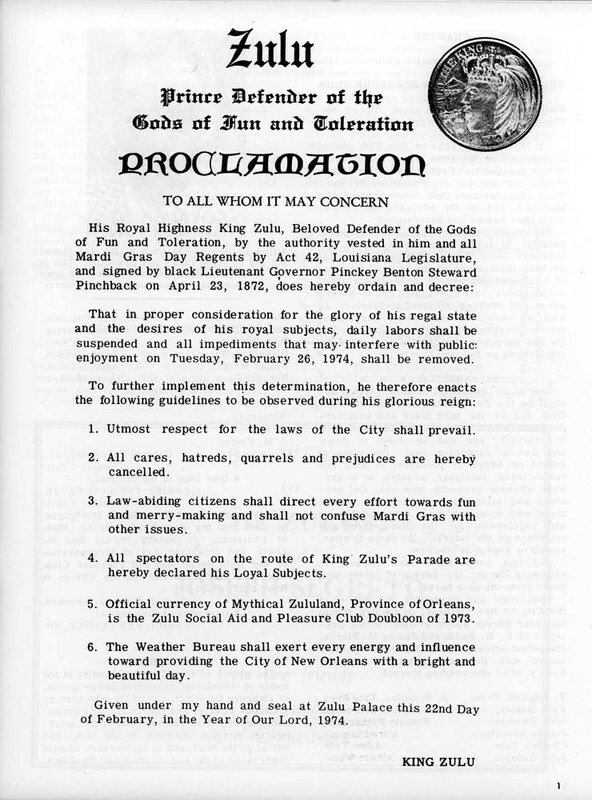 August Darbonne, “Zulu Social Aid and Pleasure Club,” New Orleans Historical, accessed April 24, 2019, https://neworleanshistorical.org/items/show/1469. “History of The Zulu Social Aid & Pleasure Club” Kreweofzulu.com http://www.kreweofzulu.com/history.